Well, I'll never complain about LIPA (our local electric company) again. Hurricane Sandy blew like stink all night, but by morning, it had blown itself out. Patches of blue in the sky alternated with fitful gusts of rain, and you could tell it was over. Yesterday was all about preparation. Our house was built by an Italian mason in the 1920s -- fired clay blocks plastered with concrete -- so I wasn't too worried about that. But when I paid a final visit to the Blue Moon, I discovered some of the boaters around me were putting extensions on their mooring pendants. The NWS was calling for an 8-10 foot storm surge that would put everyone's moorings under water. If your mooring pendant was too short (the argument went) the boat would pull the anchor right out of the mud. And then where would you be? On the beach, in short order. That sounded bad, but I didn't like the idea of changing my mooring set up at the last minute. My pendants, chafing gear, pendant flotation, etc., had been worked out by trial and error for 2 years. I had 100% faith in it. Any addition would be risky. What line should I use? How could I attach it to the existing pendants without weakening the line? What about chafe protection on the extension? Would the longer lines sink and wrap around the mooring chain, thus defeating the whole exercise? Clearly, it wasn't something to tackle without thinking through, so rather than throw together something on the mooring, I went home and had a think. I had some plastic hose that would slip over the line and solve the chafe problem. But how to attach the extensions to the existing pendants? The pendants had nice eye spliced into the ends that slipped over my Samson post. What was the best way to bend a line onto an eye? Several lengths of plastic hose took care of the chafing gear and I grabbed some hot-water pipe insulation to wire tie onto the lines to keep them floating. To the left is a parking lot (see lines) and the town dock, underwater except for the rails. 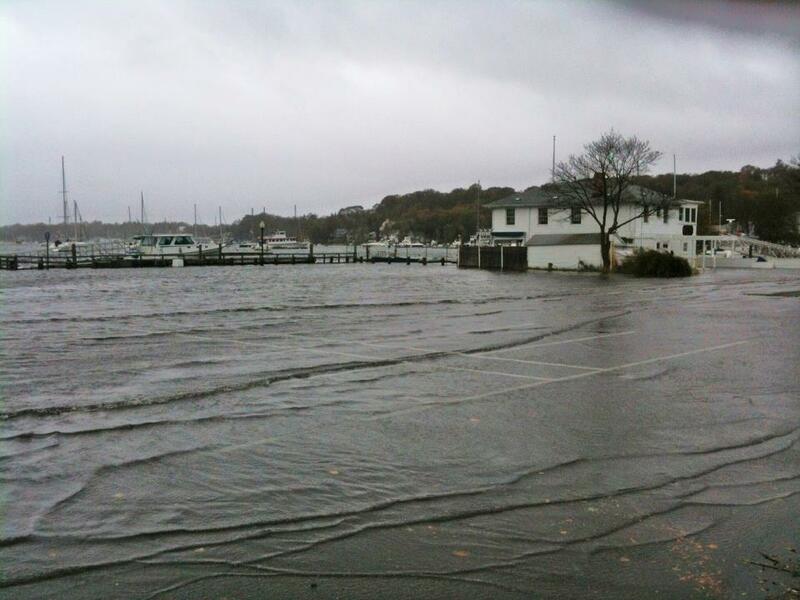 The yacht club is already surrounded by water. The tide is about 2 feet above high water. Eyes roll thinking what high tide would be like in the midst of the storm, with a full moon. But by then Helena and I were hunkered down in our stone house. In the first hour of the storm, a deep-throated crunch outside signaled the end of an four foot thick oak tree in a neighbor's yard. It fell across the street and onto the power lines. That was the end of our electric. But first thing this morning, the LIPA crew was on hand, chain-sawing the massive tree, and hooking up wires. By lunch time, we had electricity and Internet back up. Wow! A little luck never hurts a sailor. Hope Blue Moon rode it out OK. Absolutely no problem, thank goodness. Glad to hear you weathered this one without incident and that the Blue Moon is safe. Any snow on Burden Lake? Nice set of timely posts. Thanks. I believe that "bend" might be a cow hitch. Ashley has that one too. Definitely has a family resemblance. It's called a square knot, among other things. Ah, that's what it reminded me of. 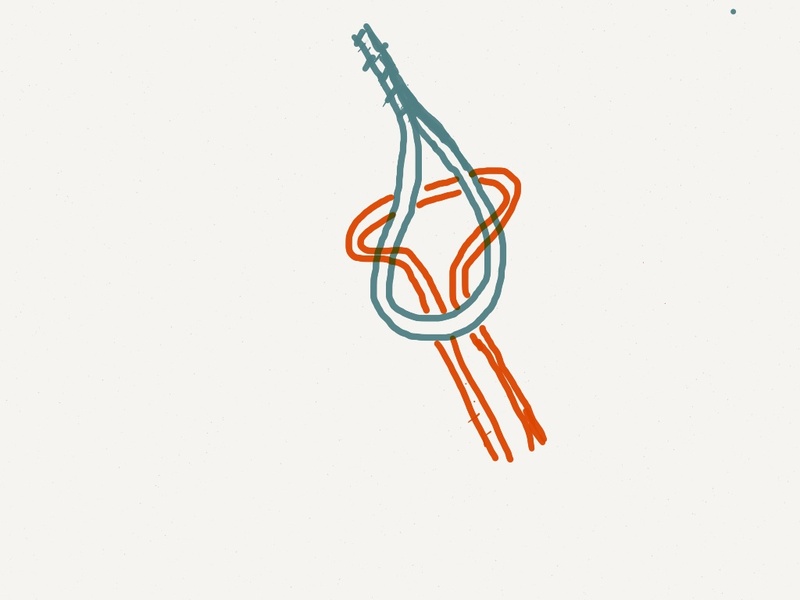 It has the same shape as a square or reef knot. Of course, it wasn't really 'tied' at all. Just looped together, so to speak. Thank you very much for that post. I was just sitting down to write to you to hope that you, Helena, and Blue Moon had ridden it all out well, when your post came in. I'm sure that there were a lot of people round the world wishing for you too. I spent 8 years or so in the Cyclone (Hurricane) belt in N.W. Australia when I was working for NASA, so have experience of that sort of weather. At least we didn't get snow too! Yes, as the news about other parts of New York and New Jersey is coming out, we are realizing just how lucky we were. It is looking very bad indeed, in some places. Would love to hear more about your NASA experience, as would others, I'm sure. Would you like to do a 'guest' blog post (or two or three) to tell some of your stories? Shoot me an email: john(at)unlikelyboatbuilder(dot)com. Congratulations John. To push your luck a bit further . . . could you ask your neighbour for some of that oak? It's there for the taking and I've inspected it, believe me. It's red oak, and the LIPA guys were not too neat about how they chopped it up (as you can imagine). So there are mainly small branches, and enormous logs. I was lusting over a solid, 4' thick section of log, but it must weight a thousand pounds. Not sure how I could get it across the street, and if I did, not sure what I'd do with it! I'm going to drive around and see what else is around. There are some lovely white oak trees a few blocks away. Glad to hear you rode the storm out well.